Zucchetta Rampicante – The Monster Squash! What an interesting vegetable to add to your garden – if you have the room! The zucchetta fruits are long and thin with seeds only in the bulbous blossom end. They grow straighter when the vines are trained to a trellis. We grew this Italian heirloom climbing squash once many years ago. It performed quite well and produced a reasonable number of very long thin-necked squash, one of which was left on the vine and grew almost 4 feet long! I wish I could find the picture of that one. We grew them on a strong 6×6 foot trellis and the vines easily grew to the top and over. The squash themselves are mostly “neck” with a small bulbous end that contains the seeds. The long, thin neck is solid flesh which we sliced fairly thin and sautéed like zucchini. This year we again included zucchetta in our repertoire of garden vegetables. Our garden is much larger now than it was back then but we are still growing them on a trellis because they are such great climbers and it saves space in the garden. 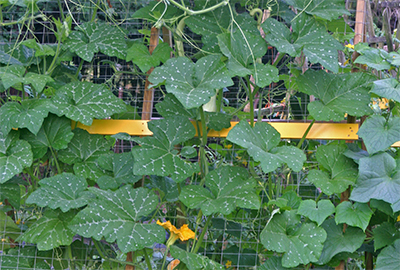 Growing them on a trellis also seems to keep the fruit growing straighter and not as twisted. Our zucchetta plants share a double trellis with my cucumbers and at this point have sort of exploded over the top and beyond. Eric has had to get creative to provide more climbing space for them! In an attempt to keep them from invading my cucumbers, Eric added a pole and a cross piece attached to the trellis for the aggressive vines to climb over. The vines are very robust with large leaves and giant golden blooms. The foliage is quite attractive with an interesting pattern of silvery white variegation along the leaf veins and this combined with the large flowers gives the whole plant an exotic, almost tropical look. So far we have harvested 6 or 7 squash and there are many more on the way. Eric has tried to pick them while they are still “small” – only about 18″ to 24″ long with the neck less than 2″ in diameter. I have read that they can be harvested at any stage in their development but that they have the best flavor when they are young and about this size. The flesh in the neck is firm and seedless. When cooked, it has a texture more like that of a winter squash because it isn’t at all watery but rather dense. The flavor is very nice. It doesn’t have what I would call a strong “squash” taste – it’s a little more subtle with a nutty flavor. I am curious to leave a few on the vine to mature so we can try it as a winter squash. The squash is prolific but not quite as "bounteous" as zucchini can be. We have also discovered another major advantage to growing this variety of squash – bugs don’t seem to like it! In addition to our zucchetta, we are growing regular zucchini and yellow straight neck summer squash. Right now, most of these squash plants are on their way out – victims of the dreaded squash vine borer. I usually lose one or two squash plants to these pests each year but this year, they have devastated all my plants. 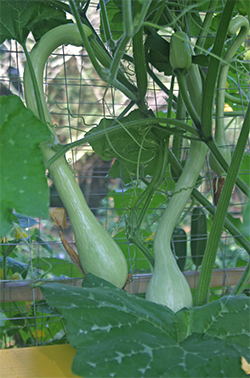 The zucchetta seems to be resistant to squash vine borers – perhaps the stem is too tough for the young larvae to bore through. It looks like we will still have plenty of squash to fill our dinner plates this August; it just won’t be zucchini or yellow summer squash from here on out. But that’s okay, the monster zucchetta squash, will more than fill the void! Yum! Well, Eric’s Three Sisters Garden seems to be a success! It has been fun watching its progress through the season. In the past few weeks, the garden has really come into its own. The beans are beginning to flower and produce fruit, one variety of corn is nearly ready, and we have harvested several very tasty, but unusual looking zucchini. We had some for dinner last night and boy was it delicious despite its funky appearance! 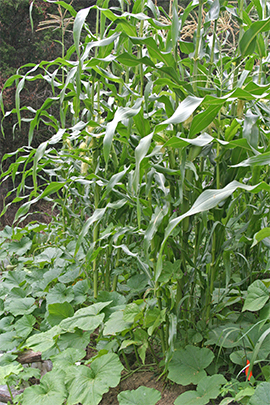 In a post last January, I talked about the story behind the Three Sisters Garden and how the Iroquois Indians considered corn, beans, and squash to be inseparable “sisters” that would only grow and thrive when planted together, each supporting the others in their own special way. It’s an interesting story of sustainable gardening that combines the nitrogen fixing properties of the bean plants with the nutritional benefits of all three of these vegetables. In early June, the corn was tall enough to plant the beans and squash. Eric had decided that this would be his new project for the summer so in May he was out there tilling up the area he wanted to plant. It was quite a job getting the area ready but he persevered and eventually it was ready to plant. He made three rows and created planting mounds in each row at the recommended spacing. 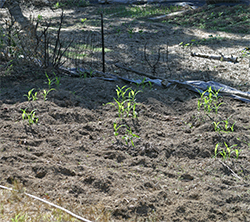 The corn was planted first; four seeds to each mound. 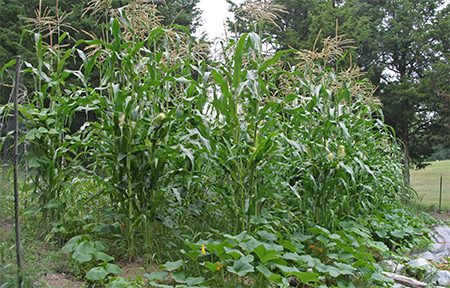 When the corn reached about 5″ tall, he planted four pole bean seeds in each corn mound and planted squash seeds between the corn/bean mounds. Unfortunately, when the squash began to germinate, some critter decided the little seedlings made a delicious meal and Eric finally resorted to surrounding the whole garden with a fence of wildlife netting as a deterrent to these munching animals. This seemed to work and the replanted squash eventually caught up with the rest of the garden. 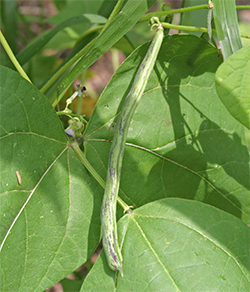 The purple pole beans (Trionfo Violetto) have climbed up the corn stalks and are beginning to form beans. Now the corn is tall and strong – much taller and stronger than my patch of corn that blew over in the storm. We do think that the beans twining around the corn helped to anchor it in place which is actually one of the roles of this “sister”. The corn has formed nice big ears, some of which should be ready to pick today – yum! The pole beans have climbed up into the corn and are flowering and now producing beans. 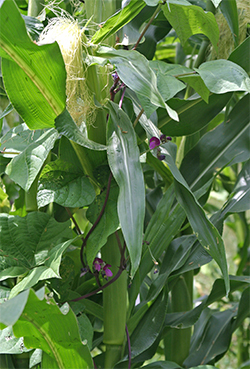 The corn makes a great support for the vines – one of its roles as a “sister”. Eric planted 3 different varieties of beans; rattlesnake beans, a purple pole bean, and scarlet runner beans. When they all begin producing in earnest, we’ll be inundated with beans! 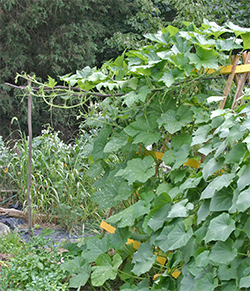 The squash grows around the corn and creates a "living mulch" to shade out the weeds. The squash is growing well, too, but so far isn’t doing as good a job at shading out the weeds as it is supposed to. The squash vines have wound around through the corn and there are butternut squash forming as well as a few other obscure varieties of winter squash that Eric wanted to try (plus the yummy zucchini). I have a feeling that negotiating through the squash vines to harvest the beans and corn might be a challenge because in addition to shading out the weeds, the prickly leaves and vines of the squash “sister” are supposed to discourage critters from wandering into the garden and eating the corn and beans. I’m beginning to wonder if this might be a deterrent to the harvesters as well! The Three Sisters Garden is a very neat gardening system! All-in-all it has worked out a lot better than I had anticipated. “Ah, ye of little faith”, Eric says! The legend of the Three Sisters will probably live on at least for a few years in our garden. We definitely have to plant it again next year so the corn can take advantage of the nitrogen that the beans have fixed into the soil. I’m sure we’ll add a bunch of compost to the garden over the winter so it will probably be even more productive next year. Like I said, I think we need a bigger freezer!